Penta Poles a Problem in Seward, in Minneapolis, in Minnesota, in the U.S.? Pentachlorophenol (penta), chromated copper arsenate (CCA) and creosote are the three major wood preservatives used in the industrial market. In recent years, demand for alternative wood preservatives such as alkaline copper quatenary and copper naphthenate has been increasing. The global wood preservatives industry is going through major changes. Creosote consumption in the United States has remained stable over the last decade. CCA use in the United States will be phased out in consumer products. In Western Europe and Japan, creosote consumption for wood preservation has declined by about 50% over the past ten years. Penta is no longer used in Western Europe and Japan and is banned in many countries (examples include Austria, India, Indonesia, Sweden and Switzerland). Several other countries are proposing a similar ban. In the European Union, its use is so severely restricted that the strict dioxin limit took penta out of the market. In the United States, the use of penta is limited to wood preservation only by certified applicators. Muessig approached her Seward neighbors and found that they, too, were suffering from the odor. Eventually, they identified the culprit: a pesticide-treated utility pole, installed in the late winter by Xcel Energy to replace an old one. The pole ... just one of 15 that were replaced last year in Seward. (Two more will be replaced in Seward by April 15, according to Xcel.) Last year, Xcel identified 753 poles for replacement, the majority in Minneapolis, as part of its regular ongoing maintenance. 227 had been installed by early December. 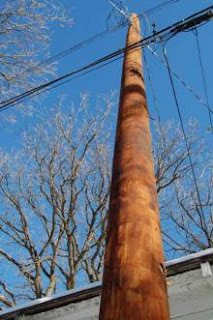 Under its current contract, Xcel uses poles treated with pentachlorophenol, a pesticide known as PCP or “penta.” Used widely during the middle of the 20th century, penta is a known toxin that is currently approved for specific use as a heavy-duty wood preservative in utility poles and crossarms. Seward residents want the “penta pole” removed and the use of penta-treated poles discontinued in the neighborhood and perhaps even the city beyond. After the emergence of the problem pole, the Seward Neighborhood Group (SNG) board passed a resolution asking that Xcel remove the pole and seek alternative, “nontoxic” materials to be used instead; and that Xcel notify SNG where the other recently installed poles are and give advance notice of when and where poles would be replaced in the future. Most importantly, Xcel cites the Environmental Protection Agency’s (EPA) recertification just this fall — “after 20 years of studies” — of the use of penta to treat utility poles. Residents found themselves in an “agree-to-disagree” stalemate at a civil-yet-tense public meeting on Dec. 4 at Matthews Park. While the meeting was, by and large, the “open and civil discussion” called for by moderator and Seward resident John Irvin, it seemed to end in an impasse, with residents largely mistrusting the EPA’s reregistration of penta — and wondering what the next step is with Xcel on the issue. First registered as a wood preservative in 1936, pentachlorophenol was used in a variety of products and processes in the middle half of the last century. Xcel voluntarily suspended its pole-replacement work from August until November, when the EPA’s decision came through — for which Gordon thanked them at the Dec. 4 meeting. However, Gordon continues to be concerned about Xcel’s use of penta-treated poles, and he is “trying to figure out what authority we have as a city,” he said. “I don’t know if we have any.” Like others, Gordon questioned the validity of the EPA’s findings. The recently confirmed approval is key to Xcel’s defense of penta-treated poles, but Xcel and industry representatives sought to reassure concerned citizens at the Dec. 4 meeting in other ways, with an explanation of the creation and use of the pesticide and poles. Alan Srock, director of design and construction for Xcel, gave an overview about its 40-year use of penta-treated utility poles, which make up 95 percent of its 500,000 poles currently in service. Price is also a factor; Xcel sends out a request for proposals seeking the cheapest poles, Srock said during the meeting. Xcel currently buys its poles from the supplier Koppers, whose representative Troy Calabrese attended the Dec. 4 meeting. Calabrese said a penta-treated, 40-foot class-four pole costs about $275; Nystuen said in her email response that $350 is a more accurate number. According to Calabrese, penta poles are treated at a volume of .38 pounds per cubic foot — the lowest possible retention, he pointed out. John Wilkinson, of penta producer KMG and the Penta Council, introduced himself as “the bad guy” and further defended the chemical, citing the recent reregistration, the decades of “comprehensive review of toxicological studies.” He reiterated the EPA’s conclusion that utility-pole uses of penta are not likely to present a significant acute or chronic risk to people [or other organisms]; that the small amount of penta that may leach out of poles is unlikely to pose risks to humans via exposure; and that significant residential exposures to children are not anticipated. “The dose is the danger,” Wilkinson argued with environmentally minded residents toward the end of the meeting, insisting that the level of penta in utility poles was not enough to cause risk. Seward residents were unconvinced by the industry presentations. “Nothing I’ve read has convinced me I shouldn’t be very concerned,” said Muessig, adding that there is no study about penta’s use in “dense, urban areas” like Minneapolis. Worries among the assembled included penta leaching into the soil, kids touching the pole, inhalation and “nasty fumes” entering their home all day on warmer days, Muessig said. Those in opposition point out that penta has been banned (or more accurately: “banned, withdrawn, severely restricted or not approved,” according to a United Nations report) in 26 countries, saying it’s just a matter of time before it’s totally eliminated. The review also points out the dangers in disposal of penta-treated poles, as well; common methods include disposal in landfills, incineration or recycling for other uses — including reuse by unwary consumers. Finally, the review outlines alternatives to penta-treated poles, stating that “there are several reasonable, affordable and significantly less harmful alternatives available to replace penta” and “similarly toxic chemicals” like creosote and chromate copper arsenate, which are also used to treat wood poles. Alternatives include “environmentally friendly wood preservatives” copper napthenate and alkaline copper quaternary, and other materials like concrete, steel, fiberglass and underground cables. Xcel is considering other preservative options, Nystuen wrote, including creosote, chromated copper arsenate and copper naphthenate. Xcel’s current request for proposals, “was written in such a way to consider a variety of options … and it also allows the vendors to suggest alternative options,” stated Nystuen. Justin Eibenholzl, environmental coordinator for the Southeast Como Improvement Association (SECIA) said there were some “some pretty big stinkers” (replaced poles) in his area, as well. As Bruininks announced Friday to the Board of Regents, University departments have been asked to work on preliminary budget planning parameters based on 5 percent to 8 percent reductions. It will be the individual departments’ responsibilities to make these cuts. Department financial officers did not return calls or comment on what specific programs might be cut as of press time. In an e-mail obtained by The Minnesota Daily, University spokesman Dan Wolter encouraged encouraged administrators and communications directors to consult with the University News Service before commenting on potential cuts. Tsk, tsk, Dan. Remember the wise counsel of your former boss: "Cheap shots aren't free." And also remember the words of one of the professional journalists around here: "Across the University campus in the past eight years I’ve been appalled by the way student journalists have been treated by faculty, staff and administration." Big Brother Dan will take care of you naive, innocent, people who might share something embarrassing with the Daily. Let the gang who can't shoot straight do the job themselves? "University spokesman Daniel Wolter said that Bruininks does not comment on his compensation [$733,421 ] but said he was 'quite surprised he ranked as high as he did.'" " I would like to point out the correction run in the Daily yesterday regarding the email of mine you mentioned. The Daily incorrectly reported that the email was sent to faculty. It was not. It was sent to administrators and communications directors in colleges and administrative units." I thank Mr. Wolter for his comments. The original post has been modified to reflect his correction and is posted above. "However, I want to state clearly that this University, our Medical School and all health sciences schools must have industry relationships." Of course they do, Frank. This is a straw man argument and you know it. There must be complete disclosure of those relationships. There must be limits placed on what is acceptable behavior. And when the public begins to understand how much some people at the U (and elsewhere) are being paid by the pharmaceutical industry and the medical device manufacturers, there will be some embarrassing questions. And that is the point of the exercise. Sunshine is the best disinfectant, Frank. You're a doc and you should know that. Continuing medical education should NOT be funded by industry. PERIOD, end of discussion. If it is not clear to you why this should be, then all I can say is to remind you: "First, do no harm." "The Daily asserts that the initial recommendations were "groundbreaking" and revised recommendations are "too soft." I disagree. The revised recommendations are significantly more stringent than a majority of U.S. medical schools and offer a practical and pragmatic way to manage this complex, evolving issue." The Daily article by Emma Carew adequately addressed this point. The people ranking these policies - the ones who gave us a "D" - apparently don't think much of the revisions. "Finally, I expected more fairness, more facts, and less innuendo from the Daily than the coverage over the past several weeks." "More facts and less innuendo?" Frank, you are the one using innuendo here. What, exactly do you mean by this? Has the Daily been guilty of misstating any facts? What might these be? Do you believe that anyone who does not agree with you is somehow not being fair? Why was the so-called draft not distributed to all medical school faculty members for comment? I spent the better part of a day in email contact with Dean Powell trying to convince her to release the draft to all faculty. I pointed out the fast shuffle on CME softening. Dr. Powell subsequently claimed in an email sent to all med school faculty that the decision to go forward with a watered down version of the document was the consensus of the medical school faculty. How can this possibly be, if not all of us saw it and had an opportunity to comment on this revision? There were people on her own panel who were unaware of this weakened document. Her statement about a consensus is at variance with the facts. Why did only one department chair send the document out? Continuing to deny the absurdity of the behavior in the medical school during this conflict of interest fiasco will not make the problem go away. The Daily is not the only news organization that finds this behavior inappropriate. The Star-Tribune editorialized that this situation is bizarre and the medical school atmosphere clubby. That certainly has been my experience. If the members of the committee were unaware of Dr. Furcht's past behavior, then how could they avail themselves of his great expertise in this matter? He obviously did not volunteer information about his past activities and the Star-Tribune had to pry it out of the U. [W]ho better to fix the system than someone who has had experience with its flaws? UD proposes we call this the Hannibal Lecter Executive Strategy. Not only was Lecter, as an object of FBI interest, experienced in the Bureau's flaws. As someone who killed and ate people, Lecter had an insider's understanding of other people who kill and eat people. Apparently Frank Cerra also subscribes to the Hannibal Lecter Executive Strategy. "Frank Cerra, the university's senior vice president for health sciences, said Friday he was familiar with the case but couldn't recall details. He said Furcht's experience could help inform the conflict-of-interest committee's work." Even though the faculty didn't know about Furcht's experience, Frank? And now, Dr. Powell is on a committee that is to discuss the decision of her own committee? And Dr. Cerra, who has already prejudged the situation is also to vet the new policy? Is the concept of conflict of interest totally foreign to the medical school AND the AHC, Frank? As Mark Twain famously said: "Denial, it ain't just a river in Egypt." Perhaps he first thought of this while on the Mississippi in Minneapolis? "Professor Clayton convened the meeting at 9:35 and welcomed Provost Sullivan to discuss amendments to the Regents policy on Academic Freedom and Responsibility that have been proposed by this Committee and additional amendments proposed by General Counsel Mark Rotenberg." Hmm... this is immediately suspicious given Counsel Rotenberg's recent record in the openness and transparency department. Those folks still on board, counselor? Oh, I see. We are still waiting for Georgia Tech to act. No doubt Provost Cerra and Dean Finnegan approve of this foot dragging? If we just stall long enough, maybe people will forget about it? Is that the strategy here? This behavior is a disgrace for an institution that aspires to be a great university. "Provost Sullivan began by asking what the Committee's goal is in seeking the amendments it has proposed in Section II. " "Professor Clayton said that when the Committee became aware of the decisions in Garcetti and Hong, it proposed amendments that would preserve what the Committee believes to be standard practice by making explicit in the policy that which all have assumed." "(Language to be added IN CAPS; language to be deleted [in brackets].)" Academic Freedom is the freedom to discuss all relevant matters in the classroom; to explore all avenues of scholarship, research, and creative expression; and to speak or write [as a public citizen] without institutional discipline or restraint ON MATTERS OF PUBLIC CONCERN AS WELL AS ON MATTERS RELATED TO PROFESSIONAL DUTIES AND THE FUNCTIONING OF THE UNIVERSITY." "Provost Sullivan said that was his assumption. He has reviewed the cases cited by the Committee, and noted that he is a lawyer, has practiced and taught, served as Dean of the Law School, and still follows court decisions closely. The Garcetti case was about an assistant district attorney and he said he does not believe that universities need be concerned that the case would be applied in the context of academic freedom." "He said he doubted that this Supreme Court, which is quite conservative, would apply the case to academic freedom, which has its own niche in the law. He said it is also clear, in the Court opinions, that if an academic freedom case were to come before the Court, that academic freedom would be defended, because this Court has been a steadfast defender of the First Amendment. The Garcetti case is an exception and he is not concerned that academic freedom will be trampled by this Supreme Court." That's a comfort, Tom. This Supreme Court? "The Committee's view is that it is better to be safe than sorry, Professor Clayton responded, because it is possible that the principles enunciated in Garcetti could be extrapolated to academic freedom." "Provost Sullivan turned next to Section III, which contained amendments proposed by the General Counsel:"
Academic Responsibility [implies] IS the faithful performance of ALL ASSIGNED academic duties and UNIVERSITY obligations, the recognition of the demands of the scholarly enterprise, and the candor to make it clear that the individual is not speaking for the institution in matters of public interest. "Professor Clayton noted that the substitution of "is" for "implies" affects the sense for the worse in asserting that “responsibility is . 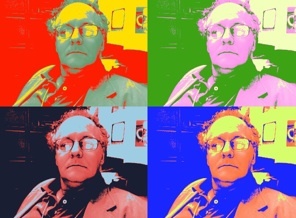 . . performance,” while also eliminating the force of “implies” in the original statement, which comprehends everything Mr. Rotenberg wishes to prescribe. "Faithful performance" includes activities that are not assigned; "faithful," he said, is a strong word. "Implies" could be replaced by "assumes," he said. " "It may be that Mr. Rotenberg was simply seeking a parallel construction between academic freedom and academic responsibility, Provost Sullivan said. When the term "implies" is used, it comes before there has been a definition of the term, and it could be that the term should be defined before getting into its implications. Professor Clayton said that "implies" expresses obligation and persons affected are to act according." "Professor Clayton asked Provost Sullivan if he approved the changes proposed by Mr. Rotenberg. " "Provost Sullivan said he would like to hear Mr. Rotenberg's definitions and why the language speaks to "academic duties" in one paragraph and "professional duties" in another. What is the distinction between "University obligations" and academic responsibility?" "Professor Clayton said the Committee would be happy to hear from him but the words speak for themselves." I always thought that the law meant what the law said, Provost Sullivan? Or did you teach your law students otherwise? "She [Professor McLoon] went on to say that she was troubled by "all assigned" duties because the language could be used to get rid of a faculty member. Say that a new chair dislikes a faculty member, so assigns him or her a lot of extra duties. Provost Sullivan said that normally there are annual discussions between a faculty member and chair, and perhaps dean, with assignments agreed on. In Professor McLoon's hypothetical there has been no agreement, or there was mutual agreement followed by a unilateral change. In either case, the issue is grievable. " "Perhaps so, Professor McLoon said, but grieving would create an uncomfortable situation in the department and pressure on the faculty member to leave." "Professor Clayton thanked Provost Sullivan for joining the meeting." "Later in the meeting, after the discussion with Chancellor Lehmkuhle, Committee members took up the policy again. They expressed views on various points: the Committee would prefer to see no changes in the policy rather than accept the proposals for Section III; "assumes" should be substituted for "implies"; the use of the word "assignments" implies that faculty have "supervisors," which they do not; and a concern that faculty could bring academic freedom claims in cases where they have been assigned to teach classes in one area after their research interests have evolved in another direction and want to teach in their new area of research (the proposed language would not make it violation of academic freedom if the chair assigns teaching irrespective of the faculty member's areas of research)." As for the possibility of grieving, Professor Abul-Hajj was skeptical. How many times will a faculty member win a grievance against the University? About 5% of the time, he surmised; the faculty, he said, will be on the losing end. The stimulus bill is not going to be enough to fix all higher education woes, wrote Gary Rhoades, general secretary of the American Association of University Professor, in an open letter to Congress and the president Wednesday. According to Rhoades, higher education is in needs of a complete overhaul and the governments continued investment. "Mr. President, and members of Congress, you have the choice to either touch the future or to torch it, to open the door of opportunity or to slam it shut, to lay a solid foundation or to leave us with little basis for future growth," he wrote. "I hope you choose the path that has led to this nation's greatness, a path not of cutting, but of building, a path not of saying 'No, we can't,' but of saying 'Yes, we can.'" He also urged the nations universities to stop trying to "move up" in rankings and to start seeking how they can better engage and serve students and communities. The University of Minnesota is on a quest to become a top three research university. It is time to re-order our priorities, President Bruininks and Provost Sullivan. You would be in a better position to argue for state support if you did this. Continuing to whine about "ambitious aspirations to become one of the top three public research institutions in the world" is not going to do it. which originally appeared on January 16, 2007. I think it stands the test of time. The clock is ticking. Are we halfway toward being one of the top three public research universities in the world? to put aside these childish things? In August, the Medical School’s conflicts of interest task force submitted a 13-page draft of changes to the conflicts of interest policy that was considered groundbreaking. Last week, an unreleased report drafted by Medical School Dean Dr. Deborah Powell surfaced that “consolidated” the previous recommendations into a two-page draft with weaker recommendations. Powell’s draft cuts essential recommendations like severing financial ties between industry and medical education programs. The original task force also recommended that any financial ties between faculty and industry be disclosed, while Powell recommended lowering the school’s current $10,000 threshold for disclosure to $500. That’s more transparency — but with room for opacity. What’s the point? A Minnesota Daily report illustrates faculty were left in the dark — despite their calls for feedback. The process simply needs more transparency and should not be headed by a soon-to-be exiting dean of the school, whom herself has been questioned on conflicts of interests with her position on the board of directors for PepsiCo and her appointment of the task force’s co-chairman Dr. Leo Furcht, who himself was disciplined in 2004 for violations of the school’s conflict of interest policy. Powell’s recommendations are improved from current ethics policy. But they are not the groundbreaking, not to mention necessary, changes that the task force proposed in August. The final report submitted to the Board of Regents in April should include the previous recommendations of the task force, not Powell’s — a person who has bungled ethics reform at the Medical School and hence should be taken off the second task force. For the ins and outs of Dr. Powell's Pepsi service, please see the post by Dr. Roy Poses: "A Medical School Joins the Pepsi Generation." "We just discussed a story from late 2006 about the Dean of the University of Minnesota Medical School joining the board of directors of PepsiAmerica." "It turns out that this has been generating continuing controversy at the institution. This controversy has shed light on some serious misconceptions among medical school leaders about what service on the board of directors of a public, for-profit corporation entails." "Each director of a public, for-profit corporation has fiduciary responsibility to the stock-holders of the company for the company's financial performance and general management." From Monks RAG, Minow N. Corporate Governance, Third Edition. Malden MA: Blackwell Publishing, 2004. P. 195. "Members of the board are not simply advisors. The notion that Powell's main role on the board is to provide "knowledge about obesity," or to be "a voice for nutrition" is naive at best. Powell is supposed to protect the stock-holders financial interests. If PepsiAmerica wanted Powell to provide advice about obesity or nutrition, it could have hired her as a consultant or put her on a scientific advisory board." "As long as academic health leaders remain on the board of corporations, which are, unlike PepsiAmerica, directly involved in health care, (e.g., pharmaceutical, biotechnology, medical device, managed care, and contract research corporations), questions will be raised about conflicts between the obligations of their day jobs and the fiduciary responsibilities entailed by their board memberships." Time to wake up, everyone? OurCEO, OurProvost? Medical school ethics is not an oxymoron. "Starting in 2004 ...an ambitious aspiration for the University--to be one of the top three public research universities in the world [sic] within a decade." The Daily has a feature called "unfit for print" and perhaps this is. But the latest news indicates that we are far from being in the top three -- of anything. Let's take some reality pills and aim for being one of the top schools in the BigTen, our natural competition. If the OurCEO isn't up to the task then maybe we should get someone who knows how to play with the cards (s)he's been dealt? Only 190 spots away from top 3! Well, it looks like we are making some good progress in becoming one of the top 3 public research institution in the world after all. Okay, so maybe not. According to a new ranking system by StateUniversity.com, the University ranked No. 193 among top 2,000 in the country. Yes, that's right. This ranking only includes schools in the country. The ranking is based on statistical data from universities, unlike many ranking systems that include a peer rating system as part of its process. Medical School Ethics Is Not An Oxymoron? An unreleased draft report from U of M Med School Dean Dr. Deborah Powell shows step toward weaker ethics reform at the school. University of Minnesota Medical School Dean Dr. Deborah Powell is moving the institution toward weaker ethics reform than her own task force previously recommended, an unreleased draft report obtained by The Minnesota Daily indicates. Incorporating some, but not all, aspects of what many viewed as hard-line and progressive recommendations by the school’s conflicts of interest task force, Powell’s draft moves the long-coming policy reform in a much softer direction than expected, sources close to the reform said. From the 13-page report filed by the task force in August, Powell has solicited comments from faculty and consolidated the recommendations into a two-page draft, which will be the basis for a final report to the Board of Regents in April, said Academic Health Center spokeswoman Molly Portz. Powell's report is just one part of an in-depth look at the need for reform at the school. That includes community focus groups, an independent review of current policies and input from faculty. That information will go to a separate, higher-level committee, that includes Powell, before any recommendations are brought to the Regents, Dr Frank Cerra, senior vice president for health sciences, told the Daily last month. But critics of Powell’s report point to a disconnect between the task force’s recommendations and the draft, saying the dean has eliminated some of the strongest and boldest recommendations with little to no explanation. Despite a recent announcement from University President Bob Bruininks that she will leave the dean’s post July 1, Powell will remain at the helm of the ethics reform as planned, Portz said. Still, the controversy from Powell’s latest reform proposal is just the most recent example of a tenure at the school that been mired in questions over her position on the board of directors for Pepsi Co. and conflicts of interest concerns. 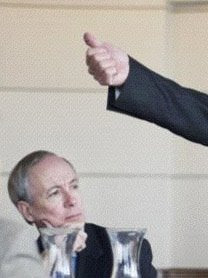 Even the Medical School task force’s co-chairman, Dr. Leo Furcht, a Powell appointee, was disciplined for severe violations of the University’s conflict of interest policy in 2004 – a fact that was not disclosed to other members of the task force until reported by the Star Tribune late last year. A signed letter from Powell accompanied the panel’s findings, according to a copy provided to The Daily. Key elements of the task force’s recommendations, believed by some to be among the most needed changes, are notably absent from Powell’s draft, among them a recommendation to sever financial ties between industry and continuing medical education programs. If enacted, that recommendation “would’ve put Minnesota on the map,” task force member and University journalism professor Gary Schwitzer said. Powell also rejected the task force’s recommendation to eliminate the level at which Medical School faculty and staff would be required to disclose financial relationships with industry. Powell recommended lowering the school’s current $10,000 threshold to $500, while the task force sought to do away with it all together. The task force recommended that faculty fully disclose the source of research funding as well, particularly those with clinical trials funded by industry, something Powell did not include in her recommendations. Although the task force filed its recommendations to AHC leadership last summer, some members of the task force and faculty at the school contacted by The Daily were unaware the new draft existed. Schwitzer said he felt in the dark, and news of Powell’s draft report “blindsided” him. Powell’s draft, dated January 2009, has been circulating through the Medical School at the discretion of the department heads who received it. Dr. Aaron Friedman, head of the pediatrics department, sent the draft to his entire department. “I wanted them to review this most recent draft and offer any comments, concerns, or questions,” Friedman said in a statement provided by Portz. Faculty in his department had previously been given the opportunity to comment on earlier drafts of the proposed policy changes. As of late Thursday Portz had not confirmed which department heads had received Powell’s draft report. Powell’s recommendations are weaker in many ways compared to those from the conflict of interest task force, Gabriel Silverman, American Medical Student Association Scorecard director, said. Still, even Powell’s recommendations are an improvement from the current conflict of interest policies, which earned a ‘D’ from the AMSA Scorecard in June of last year. In an interview with The Daily last month, Silverman said AMSA would commend the school if it enacted the task force’s recommendations. Now he’s not so sure. Silverman also pointed to the loss of the provision separating industry ties to continuing medical education at the school as a concern with Powell’s recommendations. The education program is the best way for doctors to stay current on medical advancements, he said, calling it “irresponsible” to allow that relationship to continue. “If a doctor in the community can't go to a prestigious public university like Minnesota for continuing education programs that are free from industry sponsorship, then where can she go?” he asked. -Emma L. Carew is a senior staff reporter. Jake Grovum is editor of the projects desk.